THE recent talks between the Afghan Taliban and the US interlocutors in Doha have raised hopes of achieving peace in Afghanistan. The success of the talks will also decide the fate of Pakistani militants, allegedly hiding in Afghanistan. At the same time, trade relations between Afghanistan and Pakistan as well as issues linked to border security will also come under immediate consideration in bilateral diplomatic discourse. Many in the Pakistani establishment believe that a negotiated settlement with the Afghan Taliban will reduce the impact of the hybrid warfare against Pakistan and will help in defusing anti-establishment sentiments in Khyber Pakhtunkhwa (KP). The Pakhtun can be exploited by two things, it is said: religion and emotions. “Pakistan and its military have successfully defeated forces using religious ethos to undermine the state and are now working on offsetting the forces playing with innocent people’s sentiments,” a military official told reporters, with an implied reference to the Pakhtun Tahaffuz Movement (PTM), in Miramshah, during a guided tour arranged for local and foreign media persons by the Inter-Services Public Relations (ISPR) last weekend. The army wants an acknowledgement of its unprecedented successes in the ‘war against terrorism’ and the role it is playing for the socio-economic uplift of the tribal region. Throughout the tour, the PTM remained a dominant discourse in the media-military interaction. The first stopover was the Corps Headquarters, Peshawar, where 11 Corps Commander Lt Gen Shaheen gave a briefing about his corps’ achievements, both in countering terrorism and the socio-economic development of the tribal region. In the discussion, the PTM emerged as a critical factor hampering the trust-building process between the military and local community; it was also seen as negatively impacting the morale of the security forces deployed in the region. The corps commander elaborated as far as the the military is concerned, the PTM factor was opening up space for the actors such as the Tehreek-Taliban Pakistan (TTP). The total strength of the militants associated with the TTP has been estimated between 3,350 and 4,200, that are mainly based in Afghanistan but also have a presence in Pakistan, as reflected from their continuing attacks in the tribal region. TTP militants launched 11 attacks in North Waziristan last year in which they had killed 14 people and left 50 others injured. The Pakistan Army is not underestimating the operational capabilities of the TTP and is waiting for the results of the talks between the Afghan Taliban and the US to design a future course of action. It is being anticipated that if talks with the Afghan Taliban succeed, Kabul will take action against the Pakistani militants based on its soil. There is also the hope that the Afghan Taliban will completely disassociate themselves from Pakistani Taliban sheltered in Afghanistan and will help in their return to Pakistan. It was told to media persons that the state is working on some mechanisms to sort out the TTP and its affiliated militant movements. “Those who want to return and live peacefully, they would be welcome,” said ISPR Director General Major General Asif Ghafoor. However, the framework for the post-Afghan Taliban reconciliation scenario has to be finalised yet. It is feared that if there is not an engagement plan for the abandoned militants, they can join the Daesh. The success of the Afghan Taliban talks is not merely linked with the TTP but will also have implications for the issue of missing persons and the Pakhtun movement. The missing persons are broadly divided into three categories. The first category is of enforced disappearances, and the Peshawar corps commander is in favour of sorting out this issue on a priority basis. The second category of the missing persons entails those who might have been killed in the conflict. Those included in the third category are the ones whose data is not available with any law enforcement agency and may have joined the militants or criminals. The last two categories can be sorted out only when the TTP and its affiliated groups are neutralised or reconciled. The PTM puts all the missing persons in one category of enforced disappearances and exploits the sentiments of the masses, according to the military version. The corps commander holds the view that most of the demands of the PTM can be sorted out through dialogue but the missing persons’ issue is critical in the context described earlier: successful management of the TTP will take the issue of enforced disappearances away from the PTM’s exploitation, some in military circles believe. 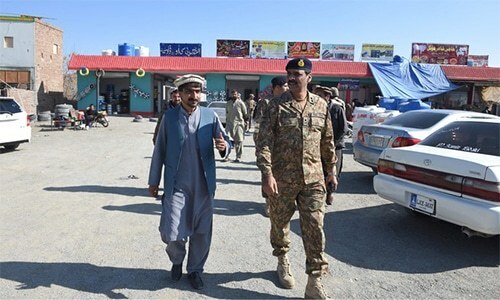 Media persons were also allowed short interactions with the local population during their visit to the infrastructure projects completed by the Pakistan army. The rehabilitation of the economy, compensation for destroyed commercial and domestic properties is still an issue after the strict security regulation on entry checkpoints. The big markets have been built but most of the shops are empty because of high rents and possession money. The local business community thinks that economic activities can be triggered if the Ghulam Khan border opens for more than a few hours in a day. Corps Commander Lt Gen Saheen told reporters. He explained that the process of developing judicial and policing infrastructure has started but people conceive it from a different perspective. The Fata merger was believed to bring a huge socio-economic change in the region but the locals have their concerns. Apparently, it is conceived that the Fata merger had been undertaken in haste, without creating an enabling environment. The military leadership thinks they have to currently work on many fronts. including the transfer of infrastructure to civilians after its completion. For the military, the rebuilding and socio-economic uplift in the tribal region is an uphill task, and it wants to do it with the trust and confidence of the local people and support of the government. Citizens want respect and the freedom to do their businesses. The military strategy of counterinsurgency in tribal region consisted of three pillars: clear, hold and transfer. But this is missing an important component between hold and transfer, and this is trust building with local communities. It could have been done in several ways, including the full civilian ownership.